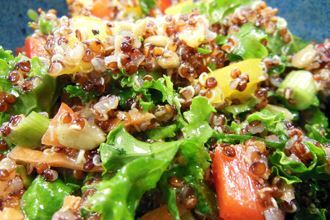 The Zesty Quinoa Salad taste test on May 7, 8 and 9 was a hit! The recipe was developed by youth through Roots for the Home Team, so it's actually served at Minnesota Twins games. Three young women from Emerge Homegrown Gardens in North Minneapolis thought up this quinoa salad using some of the favorite vegetables they grew in their Van White neighborhood garden. Kale, green peppers, tomatoes and basil made the list. They chose a lemon vinaigrette to add brightness and zip to the colorful mix.